I'm interested in learning the extent with which media files attached to your RootsMagic database have become duplicated over successive migrations of data between databases, TreeShare downloads and updates, WebHints acceptance, etc. It's my expectation that a database that has undergone many updates from an Ancestry Tree via TreeShare is liable to have a larger proportion of duplicate media files than one that has just been downloaded. Please respond to this post or its sibling on Facebook with your observations of what CCleaner says about your database's media collection. 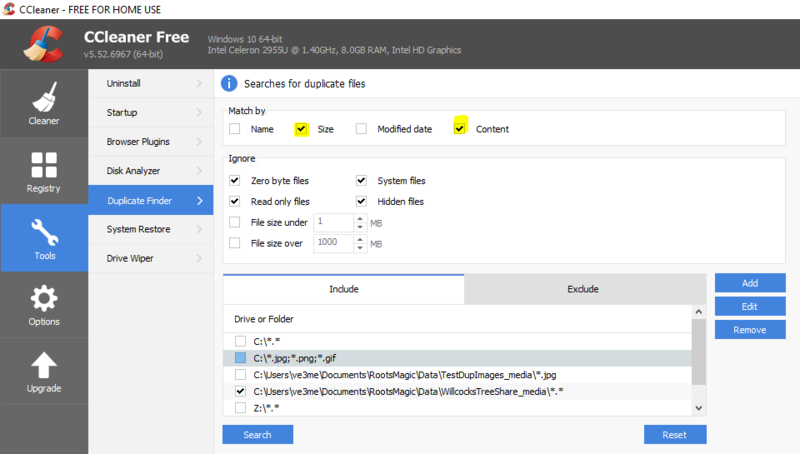 The key settings for evaluating one or more folders and sub-folders for any or selected file types are shown in this screenshot. DO NOT TICK THE BOXES "NAME" AND "MODIFIED DATE". DO SET THE PATHS TO INCLUDE TO YOUR OWN DATABASE' MEDIA FOLDER. From RM's File >Database Properties, the number of items in its Media Gallery. From CCleaner's analysis, the ballpark number of duplicate files in your database's media folder. RM says 6525 files in the Media folder and CCleaner says 2,174 are duplicates. All of these would be from TreeShare since I haven't done any other database work such as restores or extensive manual addition of media files. 1. the flag for TreeShare is reset (as expected) and now shows "new" sources for every person affected - should I accept these new sources or do nothing. That is not clear to me from your notes. 2. the exact steps to follow to delete the duplicates is not clear. The instructions as comments in the .sql file seem to be vague as to exactly what commands should be executed - perhaps that is because I don't understand the SQLite commands that well. Something needs to be executed at the Windows command line but the commands in the sql file are not Windows or DOS commands - that is the part that is confusing to me. How exactly do I identify the files that can now be deleted? Thanks for your tools and help. I've responded to your questions in a comment on the SQLite post. Sorry for the 3-day response - have been busy on choir stuff.